There are few subjects that Realtors are quite as opinionated about as open houses. Some think they are great while others swear them off like the plague. I think it might be helpful to give you my take on the subject. It is true that your home is not likely to sell as the result of an open house, but it does happen. 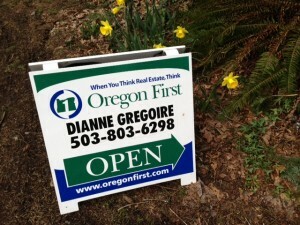 I would estimate that I have sold at least a dozen homes over the years from an open house. I have sold homes to people who walk in cold with no Realtor, but more often I have had people who came to my open go back to their own buyer’s agent and ask them to write up the offer. Public open houses are advertized to the general public, usually on websites like rmls.com, our property blotter, and on-line classifieds like trulia. It is important that the public open be advertized. While I enjoy meeting the neighbors, I want people to come through who know the price and size and are there because it fits their needs. Public open houses are usually on Sundays between noon and 4 pm. They usually are hosted for 2 to 3 hours somewhere in that window of time. Broker’s opens are held on Tuesdays here in Lake Oswego. They usually go from 11am to 1pm. Most real estate offices have a sales meeting on Tuesday mornings about 9am. The broker tour is intended to create an easy opportunity for one or a group of Realtors to easily gain access to houses to preview them for clients. Realtor’s have fantastic Internet access to photos and maps for homes which makes the need for Broker’s Tour much less than it used to be. But I put every listing on Broker’s Tour and then I host the open so that I can talk to other Realtors and really point out the features of the house. There are enough Realtors who do physically tour to make this an important part of my marketing. I also really love the professional networking that happens. I think most people who are considering buying a home feel compelled to hop into their cars on Sundays and go drive about looking for open houses. Even with the Internet, there is nothing like going inside of houses. Have your house spotlessly clean, drapes and blinds wide open, and the rooms properly staged. Open houses can be a real motivator to work on and maintain your house in show-ready condition. Feel free to give Linda or myself a call if you have any questions or if you are thinking about getting in gear to sell your home. We would love to be of help.